Respirator Equipment offered at everyday low prices. Our Respirator Fit Test Kits offer a qualitative OSHA fit testing for disposable and reusable dust and mist respirators. Choose from Bitrex Respirator Fit Test Kit, Saccharin Fit Test Kits as well as Smoke Test Kits and Banana Oil Respirator Fit Test Kits to meet your needs. 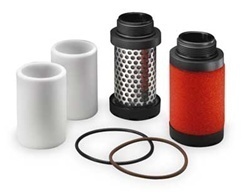 The Bitrex Respirator Fit Test Kit creates an unmistakable bitter taste that indicate break through in the respirator kit. The Saccharin Respirator Fit Test Kit produces a sweet taste if detected. Each of these Respirator Fit Test Kits come with disposable glass ampules for test and sensitivity solutions, ampoules and respirator fit test hood. Allegro Safety has a complete line of supplied aid respirators and confined space equipment. Let First Aid and Safety help you with respirator needs. We offer complete low pressure systems, or we can custom build one to fit your needs. We carry the full line of Allegro Respirator Equipment from their complete respirator systems, EZ Air PAPR Systems to accessories such as respirator cleaning wipes to Respirator Fit Test Kits to help you ensure that your respirator masks and respirator hoods fit properly for each employee. Allegro has created their line of NIOSH approved supplied air respirator systems for ease of use in confined spaces and contaminated environments. The complete respirator systems come in one box making it easy to order when needed. We also carry their Respirator Masks, Respirator Hoods and Lens Cover Peel Offs when you need to replace any of the most used parts in the kits. Allegro's Respirator Fit Test Kits offer superior fit testing for your respirator mask and hoods. Choose from smoke, bitrex or saccharin fit test kits. 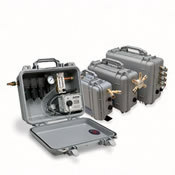 These OSHA compliant kits will meet your needs for fit testing. We also offer a full line of respirator storage cabinets in several sizes as well as respirator storage bags in many sizes and styles to meet your specific needs. Respirator hoods are an investment and we are here to help you protect that investment with storage options. Banana Oil Respirator Fit Testing Solution 8 oz.